Following on from my February offer on silencers I have decided this months offer will also be on silencers. This time the D1-D3 plunger cigar style silencer. 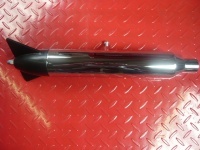 This offer is for 2 of each of the fin ended and cone silencers @ £99.00 each delivered UK mainland. The offer will run from 1st March until the 31st March 2016 or until all 4 silencers are sold which ever comes first. This offer price is for cash, direct to bank or cheque payments only, a 5% surcharge would apply if paying via paypal. Additional items placed for delivery at the same time may incur a delivery charge.